Roker Tree Services are a small, independent and family run Tree Services company, offering a friendly, polite and professional tree surgery and garden service throughout Northamptonshire and the surrounding counties. Daniel Roker is a fully qualified arborist who has been in the industry for over a decade, having started in the industry in 2000. Whilst Daniel has been employed as a tree surgeon by many prestigious organisations such as The Royal Parks and Thames Water, Roker Tree Services offers the same high standard of service to their domestic customers. Originally located in Surrey, Roker Tree Services has recently re-located and we are now offering our services throughout Northamptonshire, Buckinghamshire, Rutland, Leicestershire, Warwickshire, Oxfordshire, Cambridgeshire, Bedfordshire and Lincolnshire. Roker Tree Services offer a wide variety of services, from our standard tree surgery services through to hedge trimming and garden maintenance. If you have a garden that you feel could benefit from a tidy, or would like a clearance to allow you to start again with your garden, please give us a call to discuss your requirements. We provide many tree related services. You may have a tree that you believe to be dangerous and you’d like a qualified tree surgeon to take a look at to decide whether it could be a hazard and should be removed. Or perhaps you have a tree that requires a simple prune or thinning of the canopy to allow more light through (crown thinning), or a stump that you would like removing. We offer a range of services including: Crown reduction, Crown lift, Crown thinning, Crown cleaning, Ivy severance, Pollarding, Felling, and Stump grinding. For more information about our arboricultural services, please visit our services page. As well and pruning and felling trees, Roker Tree Services also offers firewood for sale and wood for woodcarvers and chainsaw artists. Our wood is available in various quantities, from 5kg bags up to a full truck load. 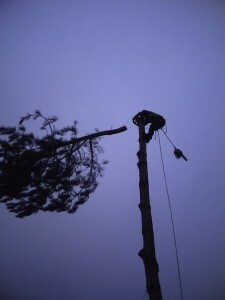 We also offer an emergency call-out service to deal with damaged or dangerous trees. To view some of our previous tree surgery work, please feel free to browse our gallery page. Please give us a call, or send us an email to discuss your requirements. thanks gordon,Yes see you soon!